In the changing landscape of M-commerce, where there is a rush to create apps for everything, which type of app works best, and which one should you choose? You have to understand that there is no objective way to go about it. All three forms have their own benefits and weaknesses. The real question is not which type of mobile app is the best, but which approach is appropriate for you and serves your needs the best. Of course Native apps bring the most immersive user engagement, and HTML 5 web apps enjoy cross platform compatibility, but do you think this is enough to base your entire mobile app strategy on? Let’s first understand the various types of apps. Basically, a uni-platform app, that gives great performance as it is integrated with your mobile device. It is made specifically for a platform (iOS or Android) and therefore, enhances user experience by using the device’s hardware like camera, GPS etc. Plus, it is available on app stores so absolutely no compromise on visibility or availability. These are apps that are developed in Html 5, CSS or Java (the most popular programming language in the world). They essentially run on a web page set on full screen mode. Programmers are more familiar with Java and HTML and hence, it is easier to develop. Also, as it runs on all platforms, it is a way cheaper option. You can download it from anywhere you want it and use it across any platform. 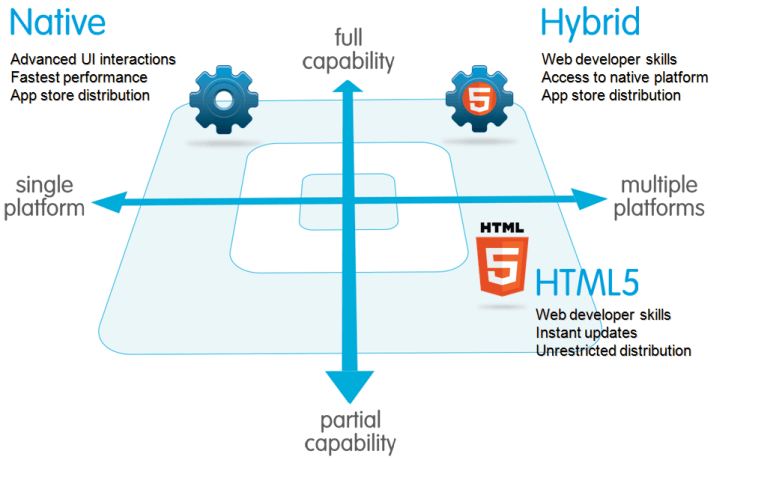 Hybrid apps are the cross between web apps and native apps. They are basically web apps in a native container, meaning, they can access the device hardware even though they are web based apps. Now that we understand which is what, let us deliberate upon what should be your preference. The native apps are heavy on providing users quality engagement and allows them to use their device hardware, which, to be honest is pretty cool. However, the flip side is, that it burns a giant hole in the pocket and takes forever to make. The primary reason is that it requires a more specialized set of skills and most programmers need to learn them and develop the app more comprehensively. Another thing which needs to be kept in mind though, is that stats show approximately 83% of apps in the app stores are ignored or overlooked by users, zombie apps is what they are known by. So unless you are Frankenstein looking for good odds, you need to think through this idea. Though web apps do not face the ‘price tag’ problem or ‘it’s-taking-too-damn-long-to-make’ problem, it has its own demons, such as a very low or no integration with the device hardware and a need of uninterrupted internet connectivity for it to run. Moreover, visibility is a disconcerting issue. Due to its web base, it is not bounded or featured in app stores, hence, absolving itself from going through the scrutiny of app store (and avoid paying their mark up price as well). The Hybrid apps, now bridge the gap between these two poles apart approach and try to give the best of both. A lot many users could not, in a survey, tell the difference between the hybrid and the native app. Hence, a well built Hybrid app delivers as much augmented engagement to the users as a native one. But, if you are torn or have not been able to zero in upon the type of app, Hybrid sure is the way to move forward.